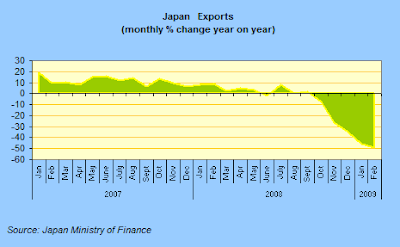 Japan's economy certainly looks to be one of the worst case scenarios globally at the moment. 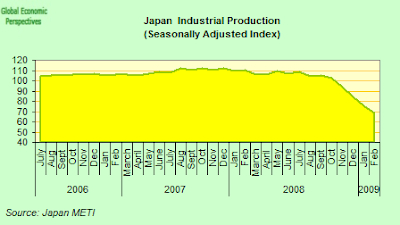 Indeed, as Claus Vistesen puts it (in a very fine and thoroughly argued post - Engine Failure - that you can see here): "Final estimates from Q4 2008 suggested that Japan contracted at an annualized 12.1% which puts Japan in the dubious pole position of biggest GDP declines among industrialised economies." 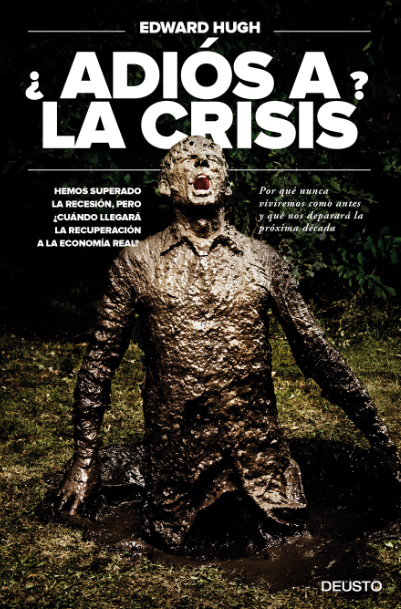 This record breaking negative performance seems in danger, not only of being repeated, but even of being surpassed, in the current quarter, since Japanese industrial output slid for the fifth month in a row in February as falling exports gradually took their toll on the entire conomy, with production being down 38.4% year on year. 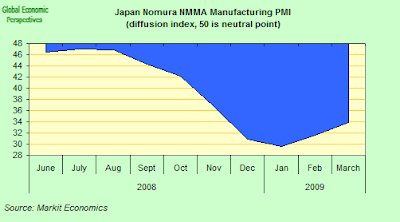 The seasonally adjusted Nomura/JMMA Japanese Manufacturing PMI (Purchasing Managers' Index) remained deeply entrenched in negative territory in March, posting a reading of 33.8. Up on February, but still well, well below the 50 contraction boundary reading. Despite rising for the second straight month, the headline index still signalled the fourth-sharpest deterioration in operating conditions recorded by the series to date. In what should be seen as a very real and immediate warning survey respondents signalled that domestic demand and the employment outlook had deteriorated as clients postponed investment expenditure given the bleak economic outlook. Data also pointed to a sharp drop in new work received from abroad. This seems to imply that we will now get an ongoing series of "second round" effects, as investment is postponed, and consumers hang on to their money just in case they are not able to hang onto their job. In another warning signal, average cost burdens declined at the fastest rate in just over seven years in March. Survey responses frequently linked the latest drop to lower prices for a wide range of raw materials amid low demand in global markets. March marked the fourth month running in which input prices have decreased. Japanese prices already seem to be well back in deflation territory. So, despite the fact that Japanese Finance Minister Kaoru Yosano said last Friday that February's fall in the so called "core-core" consumer price index doesn't mean Japan is back in deflation, few are ready to accept his judgement. Indeed, if you look at the core-core line in the chart below, it is at least debateable whether the Japanese economy was ever out of it in the first place. But the present debate has really been set of by data that was released on Friday which showed a 0.1% on-year fall in the core-core index (that is the basic index with food and energy stripped out), while the core consumer price index (which only excludes food) was flat from a year earlier. The average index reading over the quarter dropped from 36.6 in Q4 2008 to 31.7 in Q1 2009. It is hard to put a precise GDP number on what this means, but plunging global demand - the World Trade Organization said last week that global commerce may well shrink 9 percent this year - and weak consumption at home, may well mean Japan’s economy shrinking by anything between 3% and 4% per cent in the first quarter, extending the run of contraction to four quarters in a row. Japan’s exports plunged a record 49.4 percent in February as deepening recessions elsewhere hit demand for Japanese products. Shipments to the U.S., which is still Japan’s biggest market, tumbled an unprecedented 58.4 percent from a year earlier, with automobile exports down a horrific 70.9 percent. It is clear that Japanese companies cut inventories at an unprecedented pace in February so we may well now see some sort of increase in production in coming months.Inventories fell 4.2 percent, the biggest decrease since record-keeping began in 1953. 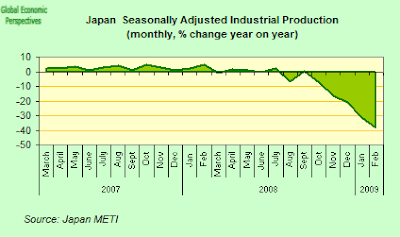 This second monthly reduction means that Japan's inventories are now at their lowest level since August 2007. Asa result manufacturers forecast they would raise output 2.9 percent in March and 3.1 percent in April - but this is not what the March PMI shows, rather there is a continuing contraction, but at a slower pace as there are not so many inventories to run down now. Toyota now expects to have adjusted inventories to levels that reflect demand by April, according to its President Katsuaki Watanabe. Toyota cut global output a record 53 percent in February and led the 56 percent decline in Japan’s domestic vehicle production, the biggest drop since at least 1967. Japan’s 12 car manufacturers produced 481,396 vehicles (according to the Japan Automobile Manufacturers Association), while car exports dropped 64 percent to 212,107 vehicles, with North American shipments falling 66 percent. As well as Toyota, Nissan, Mazda and Mitsubishi Motors all cut domestic production by at least 60 percent last month to trim inventory. Japan’s domestic car production has now posted record drops every month since November.